Art, sport, or any undertaking that requires a great deal of practice and training tend to be lonely enterprises. A writer must spend hours or days on end in front of a blank page. An athlete spends years adhering to a rigorous training schedule. All are after those 10,000 plus hours that will make them stand out among the rest. 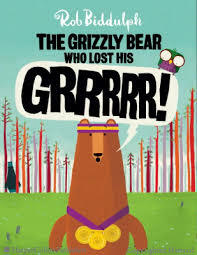 The Grizzly Bear Who Lost His Grrrrr!, a picture book written and illustrated by Rob Biddulph, what can happen if we don't stop to smell the roses. Fred is a three-time champion of the Best Bear in the Woods Contest and a star. Fred has mastered such feats as fish catching, hula-hooping, scaring humans, and especially his loud, forest shaking growl. Fred, however, is all alone. His training schedule allows no time for friends, so he makes due with his prizes, and medals, and trophies. Fred’s life changes when a new bear, Boris, comes into town and Fred mysteriously loses his Grrrr! Friends come out of the woodwork to help Fred in his time of need and he learns the value of having back up in a pinch. I love the image of Fred waking up on the day of the competition with his alarm clock, his stuffed animals, and his rocket lava lamp. It gives the sense that Fred is not just a ferocious competitor. He has loves, and passions and a unique personality. He has vulnerabilities. The tattooed bear, the pirate bear, and the gentleman bear add humor and a sense of individuality to the competitors at the starting line-up on the day of the contest. The rhyme makes the story fun and engaging. If your child/student is competitive, the description of the contest will keep them at the edge of their seats. The ending is reminder to all of us of the much repeated phrase: no man is an island.